All of our holiday homes are connected up with electricity (220 V). 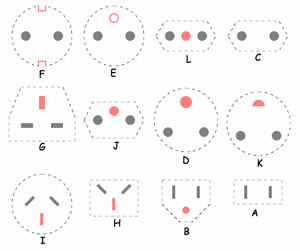 In Denmark the socket has two round holes or three holes (230 volts with earth connection). See figure C and K.
English sockets are type C and G.
The electricity-meter is placed external on the house. In modern houses the electricity-meter can be supplied with a lid. Lift the lid a bit in order to open the electricity-meter. Almost all Danish electricity-meters show the numbers without any point - all numbers are whole kilowatt. If a fuse or a group of fuses are disconnected, power cuts can occur – Relay and fuses. Read more about Electricity consumption. For settlement of the consumption of electricity, please see Consumption settling.